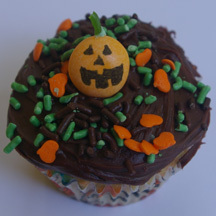 An orange-colored Mentos candy colored with food-safe pen makes the perfect Jack o’ lantern cupcake for Halloween. Try “carving” different face designs and make a whole pumpkin patch! What You Need: 1 cupcake; chocolate frosting; Halloween (or any) sprinkles; 1 orange Mentos candy from the Fruit roll; food-safe black pen; bit of green fruit roll or string. How to Make It: Frost cupcake. Use food-safe pen to draw face on Mentos for Jack-o-lantern. Attach bit of green fruit roll with dab of icing. Place on cupcake. Add sprinkles. What could be easier than arranging mint and fruit Mentos candies into the shape of a flower? Here’s a daisy! What You Need: 1 cupcake; chocolate frosting; 6 mint Mentos candies; 1 yellow Mentos candy. How to Make It: Frost cupcake. 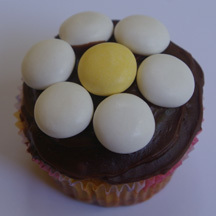 Place yellow Mentos in the center of the cupcake. Surround with mint Mentos. That’s it! The white Mentos mint candies are just the right shape and size to make a nice, fat snowman. Get out your food-safe pens and decorate your snowman! (you could use a Sharpie, but you’d need to make sure no one actually eats the candies — and that’s kind of a bummer). What You Need: 1 cupcake; chocolate frosting; 3 mint (white) Mentos candies; orange candy-covered sunflower seed (or other triangular candy); black food-safe pen; strip of fruit roll (I used Rainbow Airheads Extremes); white star, flower or snowflake sprinkles. How to Make It: Frost cupcake. Use food-safe pen to draw buttons, eyes, etc. on your snowman. Use dab of icing to attach orange sunflower seed nose. Cut or tear strip of fruit roll for scarf and wrap/place it between the first and second mint. 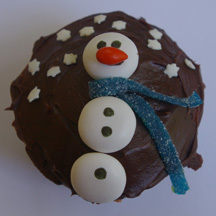 Arrange snowman’s parts on your cupcake. Add “snow” sprinkles. 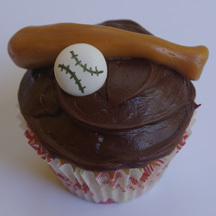 A Mentos candy with stitches drawn with a food-safe pen forms a baseball on this fun cupcake. The bat is a shaped caramel, but you could get the same effect with a Tootsie Roll, Laffy Taffy or other moldable candy. Don’t forget to wash your hands or wear gloves! What You Need: 1 cupcake; chocolate frosting; wrapped caramel; mint Mentos candy; black food-safe pen. How to Make It: Frost cupcake. Use food-safe pen to draw stitches on Mentos for ball. Shape caramel into a bat. Place on cupcake. A few weeks ago, Mentos asked to post my pig cupcake on its Facebook page. Of course, I was happy to share, and yesterday I came home to a FedEx envelope full of rolls of fruit and peppermint Mentos! Those got the creative juices flowing and thus this post begins a series of cupcakes featuring Mentos candies. What You Need: 1 cupcake; chocolate or green-tinted frosting; 4 or 5 orange Mentos candies; green fruit leather or string; scissors or knife. How to Make It: Frost cupcake with chocolate for “dirt” or green for “grass.” Cut 4 or 5 quarter-inch lengths of fruity string. 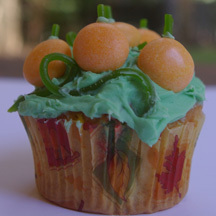 Use tiny dabs of icing to adhere to tops of Mentos for pumpkin stalks. Arrange on top of cupcake. Fill in with curls of fruit string for vines.